Some photos Milko and I took for Optik Magazine. Ramin is looking good in Vasuma Roufus! Silky soft, light buffalo horn exquisitely sets off the fine structure of the encapsulated ebony wood. This is the latest from Danish FLEYE. Very interesting and beautiful design, no wonder they were honoured with the iF Product Design Award 2014. Congratulations! 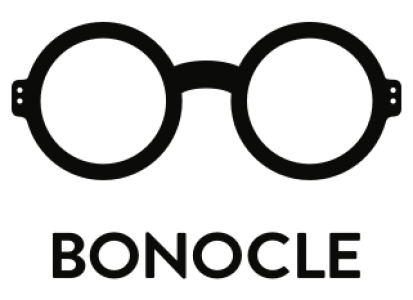 Jono Hennessy is a family business from Australia, for three generations the family has been devoted eyewear artisans. Jono Hennessy, son of optician C.H Filmer Sceats, grew up watching his father doing eye exams and fitting fashionable glasses. Exceptional quality and fit is as important as the look, his father told him which is clearly still the spirit of Jono Hennessy eyewear today. Model 8322 caught our attention. Not only is it a wonderful shape, the colours and patterns are truly amazing. Each colour is limited to 80 pieces each, worldwide. Slightly caty yet classic shape, in interesting and unique colour combinations. It’s a Bonocle fav! Woodone creates handmade glasses out of a piece of plywood, all made in South Tyrol. These two new designs caught my attention, very delicate shape and amazing glitter surface. Glam glasses 2.0! The models above are available in several wood-styles as well, such as Walnut and Cherry. See all models and colours here. Haven’t heard of Smoke & Mirrors yet? Well, remember the name as you’ll probably see a lot more from them in the future. The brand was newly founded in New York and has brought together a worldwide team of designers with design studios in New York, Paris and in the heart of Tuscany. By looking at the designs you can easily tell the inspiration comes from the late 60s and 70s rock scene. Eye Respect was born out of a desire to pay homage to the long and distinguished histories of English & Italian culture, style and standards of craftsmanship. Eye Respect frames are designed and manufactured by hand. The designs are conceived in London in the artisinal way, and then headed to Northern Italy to a family–owned workshop that has been producing the finest acetate frames for 50 years. Each frame goes through more than 60 crafted stages. If you love typography and glasses, you’ll find this fun! The Japanese company Type has combined these two and put them on your face. Just like a typeface gives the content character, glasses give your face character. Choose from the lines Garamond or Helvetica. I’m personally waiting for the Futura in Bold. Each line has three versions of the spectacles — light, regular, and bold, of course — that delineate the thickness of the frames.